Write all the attendees the day after the event. 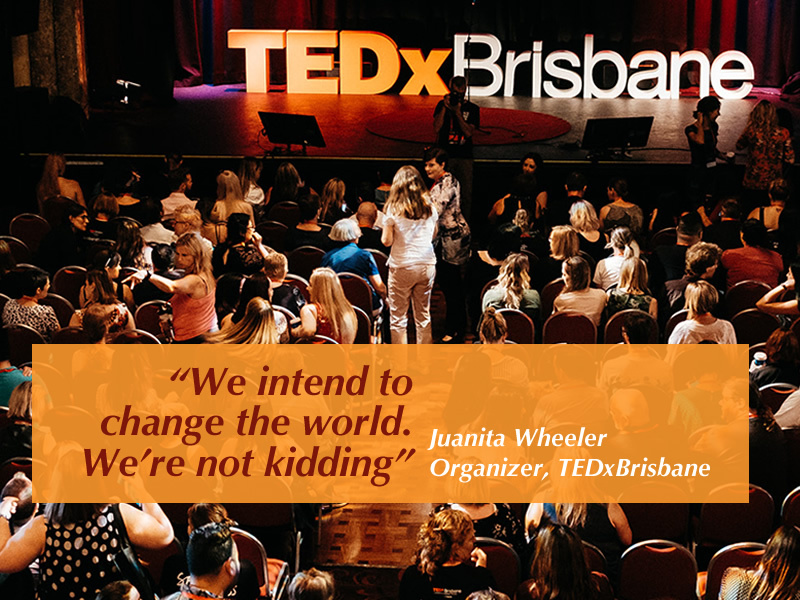 When Juanita Wheeler, Organizer of TEDxBrisbane, attended TEDxSouthBankWomen in 2012, she was at a crossroads. She was a director of global marketing for a multinational corporation, but she had fallen out of love with her work. She wanted to do something bigger, something more important, and something that would change the world. Enter TEDxBrisbane. Now, in 2018, Juanita is a full-time organizer and has enlisted her entire family to help. Let's back up. This started in 2012, then in 2013, she became a TEDx Advocate, in 2014 she was a TEDx speaker when the event was branded as TEDxSouthBank. Since 2015 her family fills critical spots. She's the Executive in charge of Curation, her husband Rob is the head of the production, and she has three kids, 24, 20 and 19 one is the experience manager, one is the greenroom manager, and one is the backstage manager in charge of the technical production. That's a lot of TEDx. I think they only have to go into the Living Room to have team meetings. There is so much richness in this episode, and it was kind of Juanita to say that the entire family listens to this podcast and gleans a lot of information every week. Thanks. Now that we have this conversation on record, she's added to the richness of several fundamental concepts you'll want to note. She's written a great article called 11 Things I wish I knew before my first TEDx. She has excellent advice for potential TEDx speakers. We're going to use this in the future. Juanita shared a few of the episodes of the show that have been helpful, Hannu's talk about pre-mortems, Ingrid's tip to use Basecamp, Craig's insight on running a green room, Gavin's deep dive on what it takes to scribe an event and Arthur Zards treatise on Adventures. What are your favorites? - What are you looking forward to? - Makes sure they're settled in on the day of and have everything they need. - follows up with them after the event to find out which of the speaker's ideas or initiatives do they want to follow up and do something about. Juanita is also passionate about making a difference and uses the term Engineering Impact to create an internal meme she repeats endlessly to partners, volunteers, team members and the community. They want to be sure everything they do engineers impact in some form or another. As an organizer who works closely with family ourselves, we applaud the commitment the Wheelers have made to their community, and we'll be taking many of the ideas she's shared to heart, as should you. Tell us a bit about your background and your TEDx origin story. This is a journey started in 2012, including a TEDx talk in 2014 and now there are 5 Wheelers behind the scenes. How many TEDx events have you worked with or produced? What makes your TEDx unique? Their Advocate Program. Listen to the show to get a complete overview of it. What was the biggest surprise while working on your event? The impact they’ve had in the community. Every event has its challenges, what was the biggest dragon you had to overcome? Money and overcoming being a perfectionist. What’s one piece of advice you have for veteran organizers? For first-timers? Have a clear mission for your event, and theirs is ENGINEERING IMPACT. Looking forward to your next event, what excites you the most? What’s a TEDx event that you’d like to attend? The show is called Hacking the Red Circle, so what's your best hack? Write the attendees the day after the event. Do you like the show? Want more? We're excited that you're enjoying the podcast. If you'd like to learn more about upcoming shows, read insights that Mark gleans from the interviews and have a voice in how the show grows, then please sign up. He saves the really good stuff for these blasts. GET UPDATES ON NEW SHOWS, INSIGHTS FROM INTERVIEWS AND INSIDER INFORMATION NOT PUBLISHED IN THE NOTES. WE'LL LET YOU KNOW WHEN THERE'S A NEW SHOW WAITING FOR YOU. Hacking the Red Circle is an independent production and is not affiliated with the TED organization.